Let me introduce you to Bos Primigenius, the Aurochs. You've seen many of his descendants, because nearly all the cattle breeds that we now raise come from him, but you have never seen him. Native to the forests of Europe, this four-legged mountain stood 74 inches tall at the shoulder (that's 6 feet, 2 inches) and he weighed about 2,000 pounds (that's a ton). Your average bull today stands about 4.5 to 5 feet tall and weighs 1,200 to 1,300 pounds. We know a lot about him because, until the 1100's A. D., this creature lived side by side with human beings. Since that was still in the Dark Ages and Western Civilization had yet to develop an effective firearm, it was considered a great challenge to hunt these beasts, because while you were hunting him, he was hunting you! With the hunters using only spears and arrows to attack him, the outcome of the conflict was none too certain. Consequently, it was quite well known and recorded when the last of these mighty monsters passed off the scene, in the 1100's as we've said. ﻿﻿ Why, then, do we find an Aurochs skull that has been penetrated by a bullet, right between the eyes. 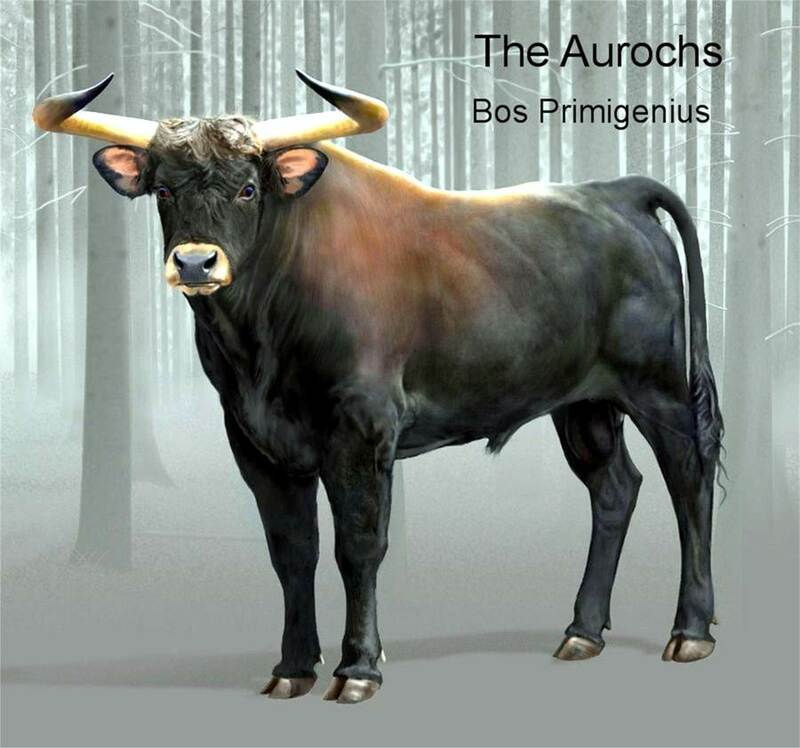 It was a small caliber bullet and, while it did penetrate the cranium, the Aurochs survived after the shot, because the edges of the bone around the hole were starting to heal. 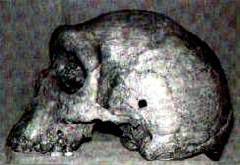 In addition, why are we finding ancient human skulls, (labeled "Neandertal" by the politically obedient researchers) that also had a bullet hole in the skull, made by a high velocity round, about .32 caliber. 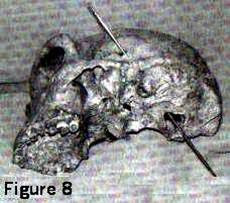 As you can see by the photo with the rod running through the skull, the bullet went straight through this person's head, on an absolutely straight trajectory. That means that this person didn't, for instance, fall and strike his head on a sharp object, nor was he struck by something like a war club with a big spike running through it. 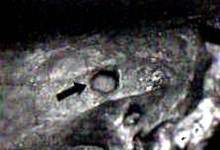 When examined by German forensic medical examiners (the people who examine the corpses of crime victims, searching for evidence, like on CSI), they determined that this was indeed a bullet wound and could be nothing else. No other impact, no other weapon, could have left such a clean and regular mark. For those who asked if the bullet hole could have been more recent, like someone using a skull they found for target practice or the result of a passing hunter's shot that accidentally hit the skull, the forensics experts say that this is impossible. The hole had to have been made while the individual was still living. Otherwise, there would have been a series of spider cracks surrounding the hole. In other words, after death the bone becomes brittle as it dries out. Any impact would have caused shattering. An ancient beast and an ancient human, both undeniably struck by a high velocity bullet in the skull, hundreds (if not thousands) of years before such weapons were developed by Western civilization - what we call "modern man." Yes, of course, mankind has developed slowly and surely from half-apes to our own exalted status.